Cooking, kitchen tools, food photography... anything that relates to food! The swivel peeler is handy when preparing cucumber ribbons for this refreshing salad. The citrus dressing is prepared in advance so the flavours infuse together. Before serving, shave the cucumber into ribbons and gently toss them together with the citrus dressing. When making this salad I like to buy the English cucumbers as they contain fewer seeds and the cucumber ribbons are firmer. Serve this salad with a nice piece of grilled salmon for a delicious healthy meal. Hold the orange over a small bowl while segmenting, to collect any juice that drips from the orange. I like to use a very sharp paring knife when segmenting the orange, so that I end up with neat slices. 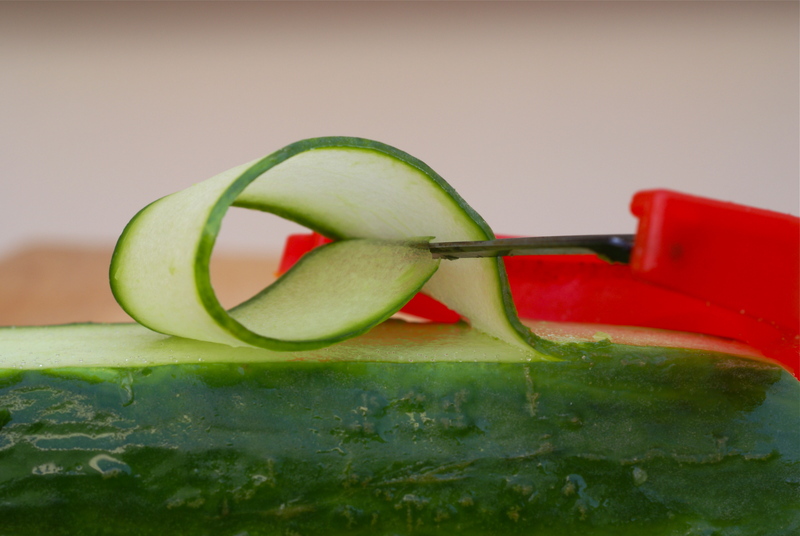 Using a swivel vegetable peeler, shave the cucumber lengthways into neat ribbons. How to make: Place the red onion, dill, garlic, orange juice, lemon juice, sugar, virgin olive oil into a screw top jar and shake all the ingredients together until combined. Season the citrus dressing with salt and black pepper, set aside until needed.